We headed out to do a bit of sightseeing today!! 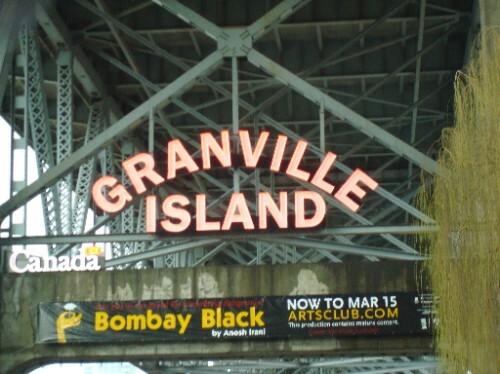 We scouted around Granville Island Market - an indoor/outdoor food/flea market.... Great food stalls with every kind of imaginable fresh pasta on display ~ beautiful bright fruit & veg stalls, and many home industry type stalls. This opens out onto the Marina promenade, where many people were sitting around having their lunch.. very pretty scenes of downtown Vancouver from across the harbour. From there we went to have Sushi for lunch!!! Not my favourite, but being the good sport, I will try most things again & again until it kills me!!! I think my aversion to Sushi may be related to the incident years ago when I went to a staff party at Yo Sushi in London, and had a rip roaring end of year party, but was so ill the next day had to phone in sick!!! To this day I maintain it was the Sushi, but it could have been the copious amounts of alcohol ~ anyway, everytime I eat Sushi now, it reminds me of that feeling, and I can't seem to get my head around it!!! After lunch we headed up into the mountains where we pulled up at a pitstop to take photos of Vancouver from the top of Cypress Mountain!!! Quite spectacular!!! From there we came back down into Deep Cove, where Kev & Kat had their wedding at Deep Cove Yatch Club ~ very pretty lake/marina. Caleb spent some energy on the kiddies swings/slides, and the sun had gone down by now, so we bundled up back into the car & headed home for dinner!! !